Start in Broome and end in Kununurra! 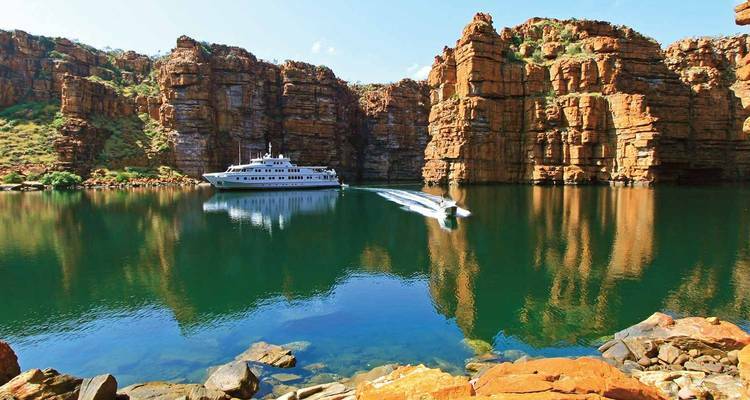 With the ocean cruise tour Kimberley Snapshot Cruise, you have a 8 day tour package taking you from Broome to Kununurra and through Broome, Australia and 5 other destinations in Australia. Kimberley Snapshot Cruise includes an expert guide, meals and more. Good selection of sites visited: correction: our tour guide / driver for south NZ was excellent. For north NZ was good. The scenic rep, Sandra was VG. From a value perspective, overall it was about average. Also, sine I booked a premium cabin on the Scenic Spirit, I was expecting all ground transport to be of equal quality. One of the buses options used a few times was quite old and run-down. Broome is the starting point and Kununurra is the endpoint. TourRadar only requires a deposit of $99 to confirm this Scenic Luxury Cruises & Tours booking. The remaining balance is then payable 95 days prior to the departure date. For any tour departing before 28 July 2019 the full payment of $9,947 is necessary. No additional cancellation fees! You can cancel the tour up to 95 days prior to the departure date and you will not need to pay the full amount of $9947 for Kimberley Snapshot Cruise, but the deposit of $99 is non-refundable. Covering a total distance of approx 956 km.